The CB 500 was a basic and popular mid range bike with legendary reliability, which is why it proved very popular with motorcycle couriers, training schools and first time riders. The CB500 twin was replaced by Honda in 2004 by the CBF500 as the CB500 engine was unable to meet the new Euro 2 emissions regulations. The main rivals to the CB500 were the Kawasaki ER5 and Suzuki GS500 E models. 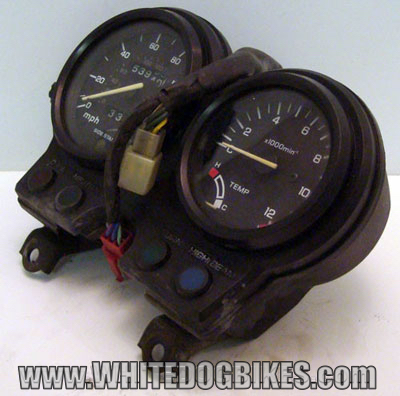 A little bit about the Honda CB 500 Twin…..
CB500-R (Dec 1993 to Dec 1994)….. Description: Unfaired 499cc twin cylinder, water cooled roadster with twin rear shock absorbers, 17 inch, 6 spoke cast wheels, round chrome surrounded headlamp, black 2 into 1 exhaust, alloy rear (pillion) grab handle and colour match front mudguard. The bike also single front disc brake with a Nissin caliper and rear drum brake. CB500-R (Jan 1995 to Oct 1995)….. Description: Same as above model with another colour added to the range. 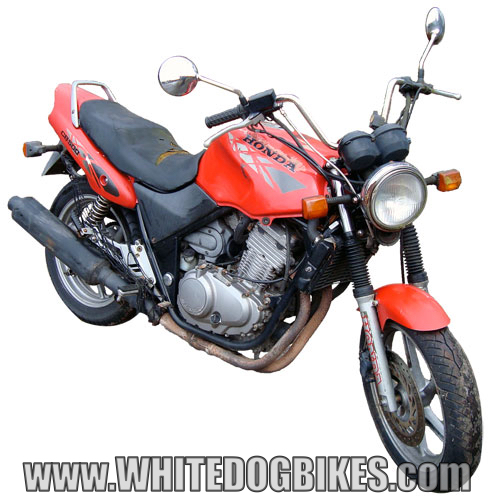 CB500-T (Nov 1995 to Oct 1996)…..
CB500-V (Nov 1996 to Nov 1997)….. Description: Same as above model but now with a rear disc brake instead of a drum brake and Brembo brake calipers. Also a ‘Cup-Race’ version available in silver. CB500-W (Dec 1997 to Oct 1998)…..
CB500-X (Nov 1998 to Aug 1999)…..
CB500-Y (Sept 1999 to Dec 2000)….. Description: Same as above model with gold wheels (painted, not real gold obviously!) and new graphics. 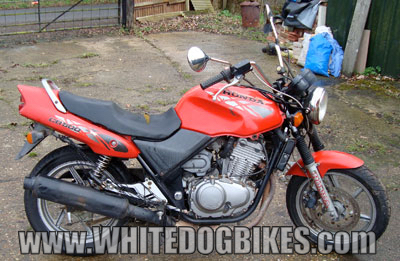 CB500-1 (Jan 2001 to Dec 2001)….. 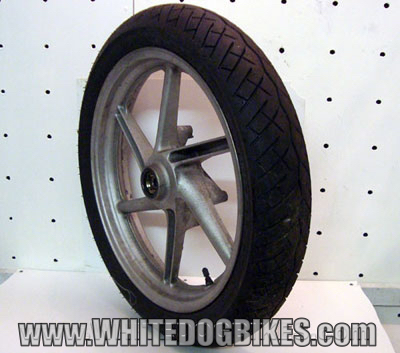 Description: Same as above model with silver wheels. 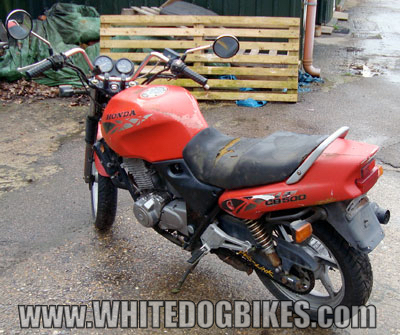 CB500-2 (Jan 2002 to Dec 2002)…..
CB500-3 (Jan 2003 to May 2003 – Discontinued)…..
CB500-SW (Feb 1998 to Oct 1998)….. Description: Basically the same as the unfaired CB500 with a half fairing with the clocks built in and underseat storage for a ‘U’ lock. Also has front and rear disc brakes (same as the later CB500’s). CB500-SX (Nov 1998 to Aug 1999)…..
CB500-SY (Sept 1999 to Dec 2000)….. Description: Same as above model but with gold wheels and new graphics. 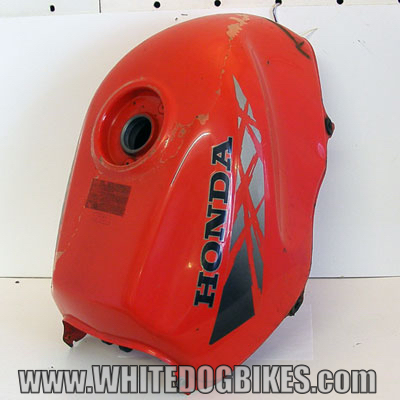 CB500-S1 (Jan 2001 to Dec 2001)….. Description: Same as above model but with silver wheels. 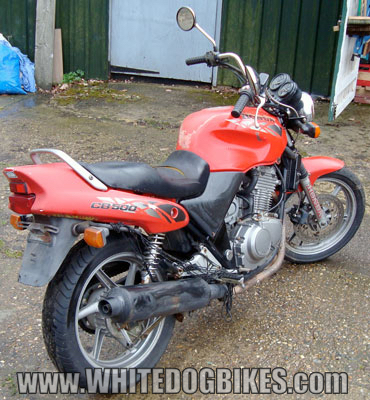 CB500-S2 (Jan 2002 to Dec 2002)…..
CB500-S3 (Jan 2003 to Mar 2003)….. The YTX9-BS battery is a 12 volt, 8 amp/hour battery and is length: 151mm width: 87mm height: 106mm in size (more info…). 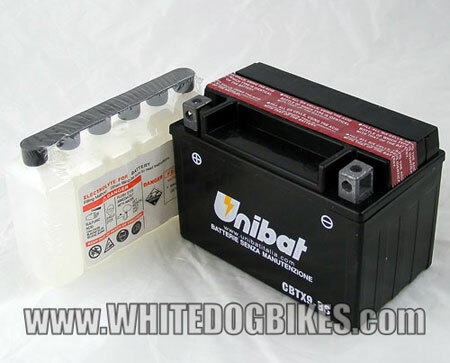 The 1st letter(s) of the battery reference code are a manufacturers reference mark and may vary between different battery makes (different battery manufacturers use different 1st letters), so CTX9-BS, YTX9-BS and CBTX9-BS are all the same battery just from different manufacturers (more info…). Also…… Avoid buying the cheapest of the cheap type batteries online as they have a horrendous failure rate (and they can be a bug!er to post back when it fails. Note: The earlier CB500 R and T, unfaired models (Dec 1993 till Oct 1996) had a drum brake on the back wheel and a Nissin caliper on the front brake. The Nissin caliper used different brake pads to the later (Brembo) caliper but the same front disc as later models. The Nov 1996 (CB500 V) model onwards and the faired (CB500 Sport) models had a rear disc brake and Brembo brake calipers. 1995 CB500-R in red. 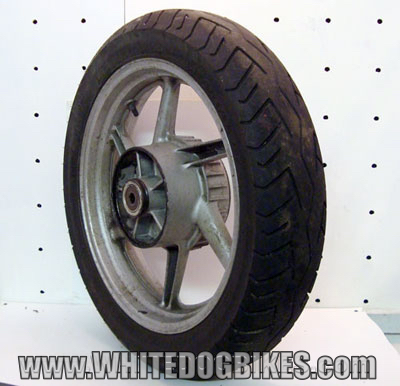 Earlier model with a rear drum brake. 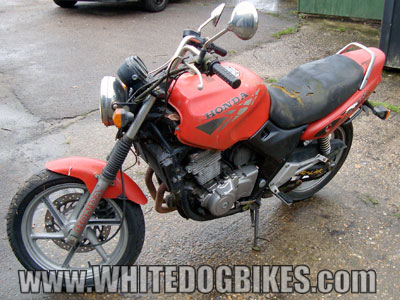 Middleweight commuter/roadster style bike from Honda that was released in 1993. Rumor has it that Honda designed the bike to last for 190,000 miles. Although you won’t find many models with 190,000 miles on the clocks, they were capable of huge mileage, fairly simple in design and easy to work on which is why they proved popular with commuters, couriers (<< avoid ex courier bikes though!) and motorbike training schools. They also had good, solid and confidence inspiring handling which is partly why training schools used them as 1st time 'big bike' riders found them easy to get along with (and, at 57bhp you could take your 'Direct Access' course on one. This allowed a rider who passed to ride any bike regardless of power or cc after they passed it. You had to be over 21 to do this course and had to take it on a bike over 50bhp). The CB500 didn't have much in the way of updates during it's 10 year life, a rear brake disc was added and the Nissin calipers were dropped for Brembo calipers for the November 1996 release and a half faired version was released in 1998 (known as the CB500 Sport). The CB500 did have it's own racing series called the CB500 Cup. Honda released a 'Cup-Race' version of the bike in 1996. The CB500 Cup was renamed to the Thundersport 500 in 2009 to allow (mainly) Kawasaki ER5 and Suzuki GS500E riders to enter. 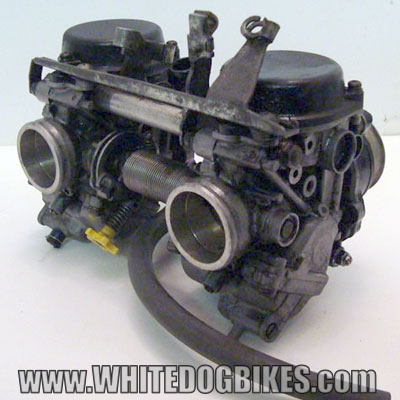 The CB500 was discontinued in 2003 as the 499cc motor was unable to meet Euro 2 emissions regulations. Firstly, if your thinking of buying one always HPI check it (there’s still loads about so no point risking getting stuck with a lemon!). These are good, solid bikes and are ideal for 1st time ‘big bike’ riders. Mileage isn’t really anything to worry about (within reason! 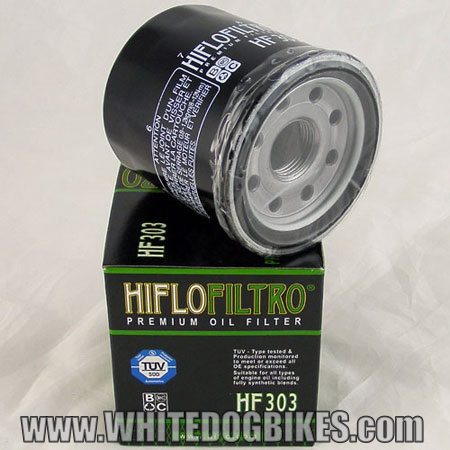 ), but obviously a bike that’s had frequent oil changes is likely to be better. As the bike was a naked/unfaired bike there’s wasn’t alot of fairing to damage and indicators, headlights etc could be easily replaced, if damaged, with aftermarket parts. Exhaust downpipes and headers do rot though (mild steel! 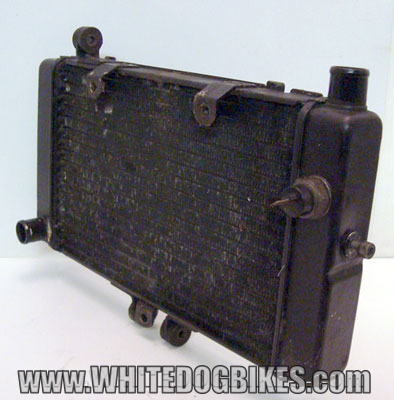 ), so in the unlikely event of the bike having the original headers, best to budget for replacing them (however, end can’s and downpipes are readily available and not stupidly overpriced). It’s probably best to avoid ex courier bikes or bikes used for racing (these were used in the Thundersport 500 series), race bikes will have drilled sump plugs, caliper bolts, scrapes etc, courier bikes will look like they’ve been round the world twice (take it from an ex courier, it’s a blerdy hard life for a bike!!). Ex training school bikes can be ok, but look for damage as, again, they can get a hard life (and budget for a new clutch!). The only other thing to consider when buying one is the age. The youngest of these beasties will be over 15 years old now, so if your buying one give it a good check over, especially rear shocks, fork stanchion condition (helps if the forks have had gaitors fitted), radiator (damage, leaks look for white water trails from the rad of pipework), handle bar switches, ignition, battery etc. Obviously, it’s worth paying a bit more for a lower mileage bike with a small rainforest of service paperwork then one of the ‘barn find’ type bikes that seem to be cropping up regularly (barn find = nicked…… Usually! 😀 ). www.thundersportgb.com Home of the Thundersport 500 series (was originally the CB500 Cup). What year did the black coated engine come out?